Why is the planet at the same temperature for any sane albedo? On entry the flux is attenuated by some proportion of the flux not making it through to the planet: therefore the flux value reaching the planet is smaller. 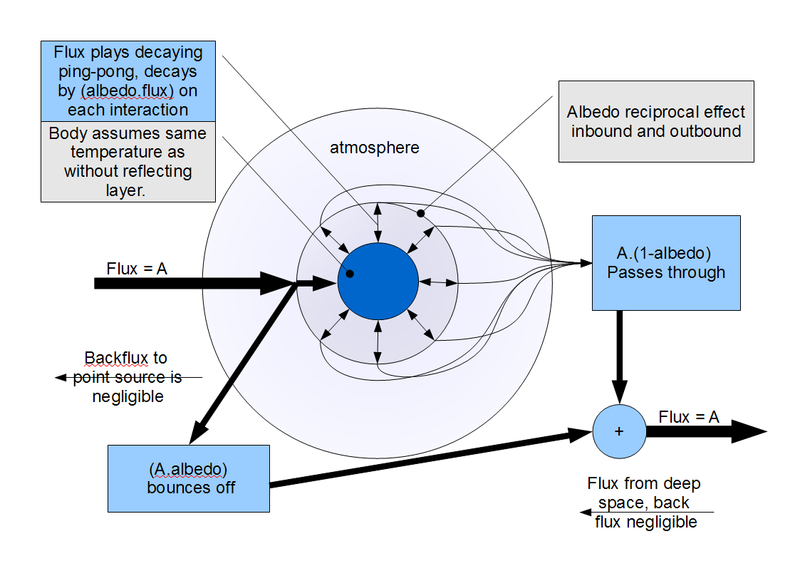 If the flux then radiated by the planet was not attenuated by albedo on the way out, where normally some returns to the planet, this is equivalent to perhaps Earth in an orbit beyond Mars and would be very cold. Albedo in and out must be very similar because that is what see for real. Each time forward radiation from the surface meets the partial reflecting layer some gets through, some is returned after a delay, no time travel, no perpetual motion. The albedo value for the dark side of a planet is poorly known, no daylight. Please note that I know there are many details, problems and connundrums which I could show in many pages, such as the frequency response of the various components, where the effect is a product of terms. Also note the flux source, such as our Sun is hotter than the planet at all frequencies/wavelengths, right down to long radio waves. Post by Tim Channon, co-moderator. Yes the concept is correct. In equilibrium, energy in has to equal energy out. This is why N&Z and Dale Huffman can safely ignore atmospheric albedo. Albedo works both ways equally. The secret lies in the difference between a ping and a pong! Tim, thanks for posting this. It seems complimentary to Greg Elliott’s posts on flow diagrams, but from another angle with a different visualisation technique. It seems to me that the GHG radiative balance argument rests on assumptions about energy distribution, not overall energy flow entering and leaving the system (once theoretical equilibrium is restored). So the argument goes that the ‘effective height’ re-emission to space takes place at sets the balance between energy content at the surface and in the high troposphere and stratosphere. “The albedo value cancels.” – Thanks Tim, I think you’re right! This is the reason for atmospheric composition having little or no influence on surface temperature, which is governed simply by the atmospheric pressure and distance from the sun. All climate processes between the top of the atmosphere and solid surface of the Earth are governed by turbulence and highly complex non-linear spatio-temporal chaos. The law of MEP ensures that the system constantly reconfigures itself to remove the maximum amount of heat. The fluctuations we observe from this mean over different time scales at both regional and global level are caused by the constant ‘re-balancing’ climate system. Dynamic quasi-cyclical equilibrium. Rog, Yes the intent is about visualisation. The diagram might help with Harry as well, who said albedo has no effect. Alternate to Greg? Only slightly because no specifics are shown. A difference is I am showing sequence more than relationship. Different way of abstracting information. A question is how to extend to cover more detailed processes, without falling into mud. By which I believe you mean that there is overlap of the spectra for sunshine and Earthshine. I am with you on this but cannot find any quantifying numbers (particularly at the CO2 absorption bands although not relevant here). Do you have a link? As each has a 25% chance of occurring, the average is zero. This supports N&Z and HDH in the assertion that atmospheric composition is irrelevant. Greg Elliot is also pursuing this with his flow diagrams albeit for CO2 only. His work rests (I believe) on there being an effect on (incoming) albedo from CO2. For that to be true, there has to be solar radiation at the CO2 absorption bands. S-B calculations show that to be insignificant but of course, as discussed elsewhere, there are problems with calculations – measured would be much more useful! BTW, I believe scenarios 1 to 4 also apply to delta additions of any single atmospheric GHG component if the red-shift from sunshine to Earthshine can somehow be quantified. Ahh, those nasty details : ) The next step in working out the details is figuring out exactly where the energy in the system is. How much is in the oceans, land and atmosphere, etc., then the temperature of that energy will tell us the direction of its flow. The interesting thing is that we already know the answers and can predict them accurately. The energy transport system is remarkably stable. Global Energy Change (global warming) is a myth. The total amount of energy in the system is constant. Ice ages and hot ages have the same amount of energy in the system, the only thing that changes between them is how the energy is distributed. And where that energy is is the problem. I suspect that way too much energy is bound up to the location of that 44m deep global band of salt that we can’t see and know little of how it is distibuted globally and temporarily. Lots of minds are getting it together. The mediating factor is the surface air pressure distribution and the gradient of the atmospheric heights between equator and poles. Especially at the tropopause since most of the atmosphere is below that level. The latitudinal shifting of the permanent climate zones and their relative sizes and intensities is the key to it all. Solar variability from above affects the atmospheric heights fom tropopause upward and oceanic variability from below affects those heights form surface to tropopause. All you need to know to diagnose tropospheric warming or cooling is the realtive sizes and positions of the permanent climate zones and particularly the behaviour of the mid latitude jets. But throughout it all the total system energy content remains much the same although distributed differently because that is determined solely by surface pressure and solar input. If one were to be asked as an Engineer to provide geo-engineering solutions to control the Earth’s climate – then one factor is likely to be paramount. Being able to control the flow of deep water brine Southwards in the North Altantic and at what depth it flows. In the Southern Ocean this process is too well goegraphically distributed to allow any hope of being able to modulate the flow. In the North Pacific there is insufficient flow to modulate. In the North Atlantic and the Mediterranean however, the presence of significant cills at the Fram Straights, Greenland to Scotland Ridge and the Camarinal Cill allow perfect conditions for modulation of the flow. If one were to construct some deep water syphons, powered if neccessary, to bypass those cills as well as to anchor some floatation bags in the existing channels then a practical way to achieve the desired results is present. If less brine is allowed to flow South at depth then less warm water will be drawn North and the Northen Hemisphere will cool. If more brine is allowed to flow South then more warm water will be drawn North and the Northern Hemisphere will warm. The deeper the syphons are, the lower the mixing of brine back into the upper ocean layers. The control at the Camarinal Cill allows the amount and density of brine in the Northern Hemisphere to be more controlled and the depth at which it flows on return. Who knows, perhaps this is what Nature has done all along! As an engineer Richard I would give a jaundiced look and start hammering in the 6 inch nails to complaints about being a lawyer. As a wit I comment the doctor ordered a saline drip. Climate wrong try a drip drop. Get that in puddles hereabouts, whereas in Lucy land they have the River Piddle. This is another proof I like against current radiative stuff and isn’t it correcting the same mathematical SB error as N&Z have importantly picked up? Have you run an article on this yet? Saw it Lucy, iirc commented elsewhere. This is likely to be a quiet thread so I am putting the above for reference:- been requests for “official” proof the solar incoming TOA goes right across GHG frequencies as some of us say. Therefore there is solar incoming exciting these gases from the top. This has repercussions. Means a good deal will bounce off and also that surface heating which would otherwise occur does not, therefore cooling which would otherwise occur does not via these channels. Overall effect on the planet? Don’t know. Progression toward simplicity and reality for planetary climate systems is rushing headlong past the AGW so called science. It will be found that only a few important parameters are needed, for the basic temp and climate, the entire universe operates on a minimum in all processes, that means stability. The developments in the last few months toward common sense have seen even some of the MSM publish ideas that would not have made it past the editor in recent times. The so called hockey team have not been practicing climatology, they have been trying to convince us that they can forecast future weather with climate models. That has not gone well. I think the saying is climate is what you expect, weather is what you get. I thank all those people with the skills who’s imput into the climate debate are slowly bringing the world to it’s senses. Tim, is that gap between TOA solar irradiance, and sea level solar irradiance, explained by “blue sky” scatter? Does the presence of ozone in the visible range, mean it’s a little bit opaque? colored? [co-mod: Sure it is there. Now show the data for DOWNWARD pointing devices. Hint, nightside temperature inversions are normal including over the sea. I think you will find this is atmospheric coupling which is cooling when conduction and scour are failing. Is it forward or reverse at night? There is much more. The ground emissions do not change other than with temperature. so if 25C ground emits at 400 watts with GHGs present then a 25C ground will emit 400Watts with no GHGs in the atmosphere. it forward or reverse at night? Are you suggesting they are measuring negative energy? They measure LWIR which is coming in line of sight only they do not measure the ground emissions. Negative, yes, if you can figure that out. I’m asking for the whole data. You need to start at the sun, follow it through. So far as I can see ghg increase the atmospheric coupling, reducing dayside surface temperature and raising nightside temperature, net yield zero. So far as I know there is no reliable data, is all over the place, a subject which starts to bang on my specialist knowledge. I don’t particularly want to go into this stuff at the moment, it’s unimportant yet for mystifying reasons perservated over by many. I think you should be patent, things will come out in the wash over many months. Lucy, I have no idea. Expect it is out there somewhere. Indeed there is. I must ASSUME that this is taken into account by the climate models. A solar spectrum chart shows that about 98% of that energy lies between about 250 nm in the UV and 4.0 microns; with the remaining as 1% left over at each end. Such graphs often have superimposed on them the actual ground level (air Mass once) spectrum; that shows the amounts of that energy taken out by primarily O2, O3, and H2O, in the case of H2O which absorbs in the visible and near IR perhaps 20% of the total solar energy is capture by water VAPOR (clear sky) clouds are an additional loss over and above that. That analysis is incomplete. An atmosphere with non GHG will absorb (say) 300 W/m^2 from the surface via conduction/convection that would otherwise be radiated to space. Since that absorbed energy cannot be radiated by the non GHG, it will remain in the atmosphere until it is absorbed by the colder surface at night or towards the poles as 300 W/m^2 that would otherwise have been lost to space. “that if the GHG theory is correct, then CO2 also has a cooling effect, which GHG does not have”. thanks. typo – should read: ” which NON GHG does not have”. To explain, the (say) 300 W/m^2 is being absorbed from the surface via conduction/convection that would otherwise be radiated to space. This takes place on the sunny side of the planet towards the tropics. This energy is then transported via wind and the rotation of the planet towards the night side and poles of the planet where it warms the surface. This provides a net warming of the surface because this energy would have otherwise been lost to space as radiation. The planets surface must warm to restore this radiation imbalance. However, when you add CO2 to the atmosphere, then is energy flux is reduced. Some of this energy flow from the sunny/equator to the night/poles will come into contact with CO2, and be radiated. About 1/2 to space, about 1/2 to the surface. The 1/2 that is radiated to the surface will not provide any net warming, because this is simply energy that would have been conducted/convected to the surface anyways by the non GHG. The other 1/2 will be radiated to space. This will cool the planet over what would have happened in the absence of CO2. Thus, when back radiation is measured at the surface. some of that radiation does not represent warming. What it represents is the mirror image of the energy of convection/conduction that should have warmed the planet, but is instead being lost to space. Thus, the idea that we can measure how much the surface is being warmed by CO2 by measuring back radiation is false, because while some of the back radiation is energy that will warm the planet, some of the back radiation is a measure of energy that is being lost to space that would otherwise be available to warm the surface. These were flows C/2 and F/2 in part one of the flow analysis. Off the top of my head it would appear that if B/2 + F/2 > C/2 then CO2 actually has a net cooling effect on the planet. 1. Gravity is the limiting factor in the exchange of energy by conduction and convention, which limits the amount by which non GHG gas can warm the planet. The reason for this is that without gravity there would be no convection, and without convection there would be reduced conduction. 2. Atmospheric density/pressure enhances the action of non GHG in warming the planet’s surface via conduction/convection in preference to radiative transfer. “lumped albedo”. Just like the real world. There water is distributed highly unevenly both as atmospheric vapour, and as liquid (clouds, oceans), and solid (ice, snow) phases. It makes you wonder how anyone could ever refer to an apparently simple single constant for water feedback (positive or negative). Also “The albedo value for the dark side of a planet is poorly known, no daylight” is a related good point. “Night is the winter of the tropics”, right? What are the effects of a change in the ratio of daytime clouds to night-time clouds? I’m not sure what you mean with this Tim. Albedo at the night side could only reflect the 3K backradiation. Lets call the earth + atmosphere SYSTEM earth. So imo albedo is the same as throttling down the sun, or placing a partly reflecting mirror outside system earth. Anything wrong sofar? Don’t go into details yet, just the broad picture. Albedo, perhaps I’ve been too casual in use of the word. I am referring to reflectivity regardless of frequency, not just for the special case of humans considering a narrow range to be light. In addition reception of flux and transmission (emission) of flux have to be reciprocal processes otherwise a perpetual motion machine is possible. Not sure I have put this well. A test is whether a uniform surfaced isolated body without atmosphere in a flux field can assume an abnormal temperature. I don’t think it can. Next step in the creation of a simple model for system earth. Initially system earth was a sphere of molten material, radiating away like crazy and thus cooling down, not much the sun could do to stop this. A very thin solid layer formed on the outside, and by outgassing an atmosphere formed, containing ao water vapour. Raining out ( and perhaps some help from the occasional meteor) formed the oceans, initialy very hot. New phase for sytem earth, hot mantle “sealed” by a thin layer of rock, covered by a hot ocean. Lets say 350K or so, way above what the sun seems capable of doing and more or less evenly distributed over the surface and into the deep of the oceans. So in this phase we have a hot mantle covered with a solid crust keeping the heat inside, and still very hot oceans. Since there is no more heat coming from the hot mantle, the oceans cool down. Next phase for system earth. It rotates, receives 70% of solar at the surface and has no tilted axis yet. By conduction, evaporation, radiation the oceans loose heat to the atmosphere. Lets assume convection hasn’t been invented yet. By conduction only the atmosphere will develop a nice lapse rate towards space. May take a couple of million years but earths is not in a hurry. We need some components of the atmosphere to radiate away to space, otherwise system earth can’t cool down at all. I think that water vapour will do the trick, but anything that works is fine to me. So the oceans are cooling through the atmosphere, and the sun is shining over the equator during daytime. Most of the cooling will be near the poles, less near the equator since the sun slows the cooling there. Since before climate science came along cold water went down, and warmer water came up, I’ll assume this still to be true, so eventually all the warm water from the bottom came up and the deep of the oceans get colder and colder. Earth is still radiating away more than it receives from the sun, and is thus still cooling. Most of the oceans have cooled down to just above freezing, lets say 275K or 277K on average. Only a small surface layer, where all the warm water from below has ended up, is still above this temp. Reason being that incoming solar and cooling through the atmosphere cancel each other out. This “band” of warm water that spans the earth is all that is required to prevent the deep oceans from cooling down. This warm band is about 750m deep at the equator, and reduces to 0m around the polar circles. So this simple model explains imo why we have a temperature that is above the GHE 255K greybody temperature without the use of backradiation or similar constructs. Let’s start adding some complexity. Axis tilt. The warm band moves north and south, following the sun with a delay of about one month. This allows the polar seas to freeze over during winter, and the sun melts the ice again during summer. Everything that changes the amount of incoming solar, changes the volume of the warm band. eg. change in TSI, Milankovitch cycles, vulcanic eruptions etc. etc. Less solar, the depth and width of the band decreases, more solar the opposite. Ocean currents transport warm water from the equator towards the poles. Warm water at the equator expands, so this water will probably flow “downhill” towards the poles, turning east due to the corriolis effect. Backflow will be in the deeper oceans probably. Continents. They will disrupt the simple ocean currents from equ. to poles. They will create “weather”, since they heat up easily, and cool down rapidly without sun. I have hardly mentioned the atmosphere, since it’s heat capacity is equal to about 3,2 m of ocean water, so rather a minor player. They’re basically a gaseous extension of the oceans. But a lot of the weather (and thus climate) can easily be explained using this simple model as base. – The incredible stabily of the oceans surface temps. during day and night surprised me. Less than 1K variation between day and night, exceptt in very calm weather. – The very small influence that the hot inner parts of the earth are supposed to have. We may be in for a surprise here. Apart from ocean vents, under water vulcanic eruptions etc. we also seem to have places where the crust is totally gone, exposing the oceans to the hot mantle. Should have some influence on the earths temperature, since the heated water will show up at the surface sooner or later. Thanks for that Tim, fascinating stuff indeed. My hypothesis doesn’t depend on the hot mantle “leaking” any heat, but I was surprised to find the “gaping wound” article. IIRC, didn’t Lord Kelvin more or less accurately guesstimate that it would take 40,000,000 years for the Earth to radiate away all the heat of formation?